Our employees are the ones who give the house its soul and who fill it with life. Our guests already feel and value this special kind of attention during the first few minutes of their stay. The hotel service is cordial and absolutely authentic. 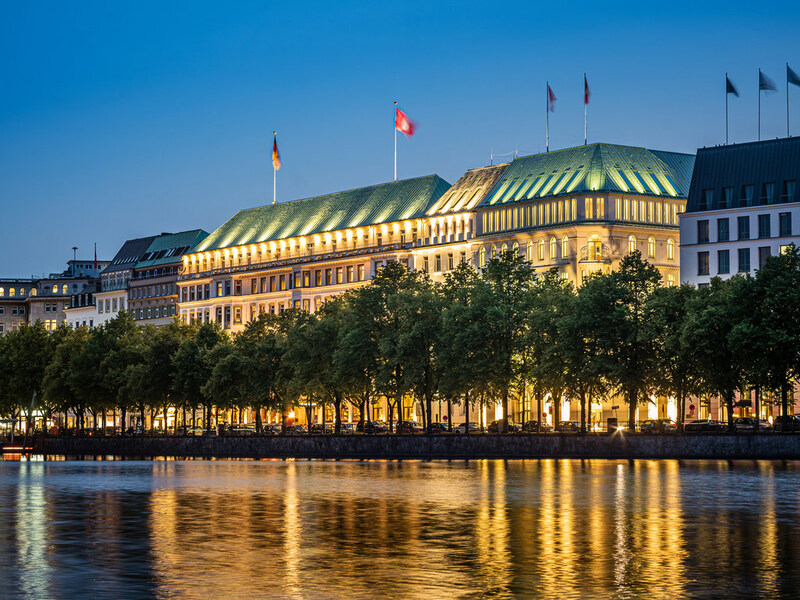 Luxurious Fairmont Hotel Vier Jahreszeiten Hamburg has become an epitome of European grandeur. Since 1897 the elegant hotel welcomes guests from all over the world with refined style and timeless grace at the Inner Alster Lake in the heart of Hamburg. 156 luxuriously furnished guest rooms and suites combine international standards with exquisite materials and fine fabrics, which are sequenced in different color concepts. The hotel's philosophy is simple: service, service and service. Fairmont Hotel Vier Jahreszeiten is an unrivalled experience: from the unique culinary diversity with 9 restaurants and bars to the Vier Jahreszeiten Spa, offering more than different massages and treatments. All 156 rooms and suites as well as all bathrooms have been thoughtfully renovated and air-conditioned in 2015 with great attention to detail- designed to meet the highest and most demanding standards. The new guest rooms present themselves in a new and contemporary spirit with impeccable richness- delicate grace and refined elegance. Many of our Hamburg accomodations offer a breathtaking view over the Inner Alster Lake. The Condi Lounge is a modern gastronomical affair. The stylish Lounge is decorated in earthy colored fabrics, retro decor, large-patterned upholstery, and warm wood tones to give the room a unique and warm ambiance. Haerlin Restaurant is one of Germany's leading gourmet restaurants. It is the proud bearer of 2 Michelin stars, 19 Gault Millau points, and was awarded 4 ½ "F" by Germany's fine-dining magazine DER FEINSCHMECKER. The Wohnhalle is the heart of the hotel and inspires a turn-of the century country house atmosphere. A wood burning fireplace adds to the oasis of calmness in this living room lounge. The menu includes a classic British Afternoon Tea. Café Condi is especially well-known for the variety of its breakfast buffet. Whether you select à la carte, continental or buffet breakfast, there's no better way to start your day. Café Condi offers a variety of local specialties for lunch and tea. Restored in the beautiful, eclectic art deco style of the 1920's, the Jahreszeiten Grill offers the experience of traditional Hanseatic dining. Full-flavored, organically grown vegetables complement the excellent fish, poultry and steaks. The Jahreszeiten Terrace offers, from April to October, outdoor seating for 80 guests. When temperatures are cooler, external radiators provide pleasant warmth and a cozy place to sit and enjoy first class food and excellent service. Using surprising combinations and intense flavors Nikkei Cuisine cultivated a style that complements the Japanese fine sense of classic elegant dishes by adding elements from Peru. Enjoy this culinary interplay of contrasts in our new design restaurant. The cozy elegant two-story Jahreszeiten Bar is the ideal place to meet friends and colleagues. The bar's quiet ambience guarantees a relaxing, convivial evening in good company. A large selection of noble spirits as well as rarities is served. Using surprising combinations and intense flavors, NIKKEI Cuisine cultivated a style that complements the Japanese fine sense of classically elegant dishes by adding Peruvian and Brazilian elements. Pessoal muito profissional, amistoso, disponível, atencioso, prontos a atender as solicitações. Estrutura hoteleira moderna, apesar da arquitetura tradicional. Localização ótima. Café da manhã muito bom.Apreciamos os hotéis da cadeia Fairmont, desde o de São Francisco at'e o de Vancouver Airport . Total disponibilidade com gentileza e elegância na recepção e em qualquer interação com o restante pessoal. Quarto muito acolhedor, quase familiar. Cama com roupa, colchão e almofadas extremamente confortáveis. We com abundantes acessórios e de muito boa qualidade. Pequenos almoços muito variados. Sala &quot;bem disposta&quot;. Decoração geral confortável e variada, consoante a época do ano. O número de funcionários à nossa disposição em qualquer momento é o que gostávamos de ter. O grau de limpeza, polimento e detalhes nas áreas comuns faz- nos sentir únicos no local. Tudo está sempre preparado para nos sentirmos bem. São excelentes em tudo.